Georgia's leaders have been praised for a vote that is expected to deliver the country's first democratic transfer of power in post-Soviet history. President Mikheil Saakashvili admitted defeat after the Georgian Dream bloc of his rival, Bidzina Ivanishvili, won Monday's parliamentary election. Four years after Russia went to war with Georgia, Moscow said it hoped for an improvement in relations. The European Union and the US both hailed the vote. The White House called it "another milestone in Georgia's democratic development", and said the country had set a "regional and global example by conducting a competitive campaign". The EU said Georgia had shown "a healthy respect for fundamental freedoms". With almost all the results in from Georgia's 3,766 polling stations, Mr Ivanishvili's opposition coalition was heading for 55% of the vote in the party list vote which accounts for 77 seats in the 150-seat parliament. 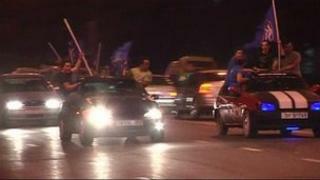 Georgian Dream supporters celebrated in the capital for a second night. Mr Saakashvili's United National Movement was trailing with 40% of the vote. It was also behind in the first-past-the-post vote in the 73 constituencies that make up the other seats in parliament. As the scale of the Georgian Dream bloc's victory became clear, Mr Saakashvili appeared on live television to say his party respected the will of the voters. "We, as an opposition force, will fight for the future of our country," he said. While Mr Ivanishvili, 56, is set to become prime minister, his rival, who has led the country since 2004, is due to remain in power until presidential elections next year. The billionaire businessman-turned-politician said the "only right decision" would now be for Mr Saakashvili to resign and call a snap presidential election. President Saakashvili came to power after Georgia's 2003 Rose Revolution and by law has to step down in 2013 after two terms in office. He steered Georgia closer to the West and took the country into a disastrous war with Russia in 2008 when he tried to bring about the return of the breakaway territory of South Ossetia, where Russia kept a peacekeeping force. Mr Ivanishvili, who made his fortune in Russia in the 1990s with stakes in metals, banking and then property, promised to rebalance relations with Moscow when he appeared before reporters on Tuesday. "We'll do our best to sort out relations with Russia," he said, but added that he was committed to maintaining ties with the EU and Nato. His success was welcomed in Moscow where Prime Minister Dmitry Medvedev said it showed that Georgians wanted change and "probably means that more constructive and responsible forces will appear in parliament". "Anything that would keep Saakashvili further away from the instruments of power is a plus for Russian-Georgian relations," said Vyacheslav Nikonov, deputy head of the Russian parliament's international affairs committee. Washington appealed to the president and Mr Ivanishvili to work together, praising Georgia's citizens for a "significant step in the consolidation of Georgian democracy". EU officials said the conduct of the vote was "generally positive", choosing not to criticise what observers had described as "a very polarising campaign".